I am pleased to announce our newest offer for donating members, the reprinted drug policy classic The Marijuana Conviction: A History of Marijuana Prohibition in the United States. 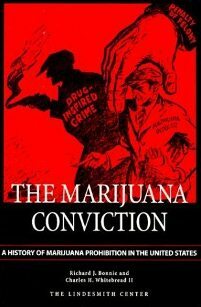 Originally published in 1974, this amazing work by professors Richard Bonnie and Charles Whitebread was the first comprehensive history of marijuana use and its prohibition in the United States. Bonnie and Whitebread's historical overview examines the origins and history of marijuana prohibition as well as the laws' unintended consequences.